This entry was posted in Art, Cotswolds, Creativity and tagged British Legion, GCHQ. Bookmark the permalink. This is a powerful statement. LOVE IT. I am so sorry Judy that I did not reply to your comment earlier. My blogging life is sadly neglected at the moment due to my caring role! But I am so glad you enjoyed the post and thank you very much for commenting. I will now try to catch up with all the bloggers I have inadvertently and unwittingly offended or ignored! I am so sorry that I did not reply to your comment earlier. My blogging life is sadly neglected at the moment due to my caring role! But I am so glad you enjoyed the post and thank you very much for commenting. I will now try to catch up with all the bloggers I have inadvertently and unwittingly offended or ignored! This is so amazing and touched me deeply. My own father was KIA WWII (flew a B-24 with the US Army 8th out of Norfolk). Of course this has influenced my reaction to anything such as you you describe here. Thank you. I’m so glad it brought back memories if your own father x bear wishes Victoria. Inspiring blog today, and I hope that 2015 is a much calmer year for you, without medical emergencies. I have just been getting back to blogging myself after some challenging times. I hoping this will be a much brighter year. Happy New Year to you! I came here to thank you for following my blog, but was also very impressed with the GCHQ installation. What a shame the public didn’t get to see it. Thanks Viv , I accidentally pressed unfollow on my phone with my butter fingers so had to quickly follow you again!! I loved the fishing post and photo by the way! Wow! I never would have guessed that is what it was from the first picture. Very interesting and heartening to know a government organization would do something like this. Glad you enjoyed the post. Thank you for reading so many of my blogs! I will enjoy getting to read yours when i get some free time. Things are a bit busy here at the moment! Thanks for reading Jake and I’m glad you enjoyed it! This is so beautiful! 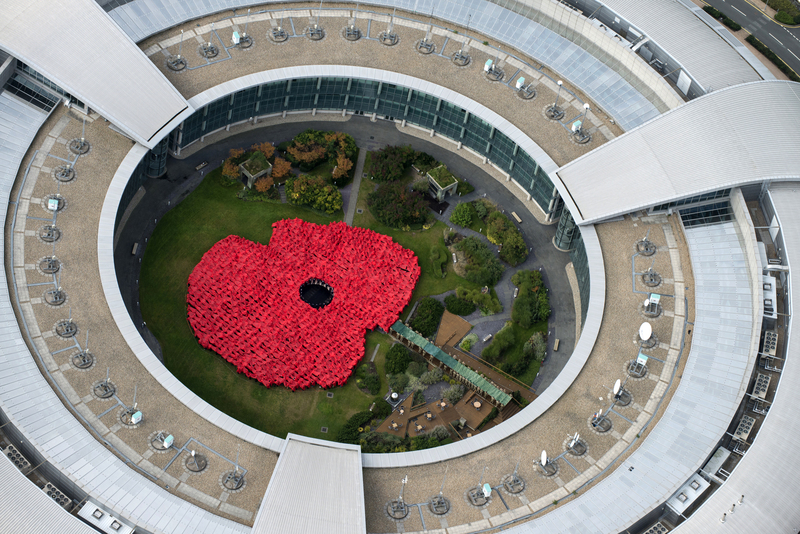 I was in London at the end of October and went to see the poppy installation around the Tower (me and another 500,000 Londoners…). It was incredible – the entire “mote” around the Tower was a sea of red.